DAVID WAS A WORSHIPER FIRST (1 Sam 16:14-23). When David was brought before King Saul to relieve him of his demons, David had already demonstrated a life worship. The anointing upon his life had power to bring deliverance to the demonically-oppressed king. Before we can approach any giant in our life or pray for any kind of deliverance, we must start in worship and adoration. It will not be our skill or intellect that will take down the giants, but the anointing that comes from a life that is daily dedicated to God’s presence. HE WAS VICTORIOUS IN PRIVATE (1 Sam 17:34-37). David was fully prepared to face the Philistine giant because he had already faced his own giants – and won. Size didn’t matter. The victories in his own back yard established his faith and confidence that was now unshakable. If we want spiritual authority in regional or national fields, we must first be faithful in our own fields of influence. Starting in our homes and then impacting our local churches and communities, our faith must bear fruit and demonstrate the results of powerful and effectual intercession. This successful track record will validate our authority and strengthen our boldness. HE CARRIED HIS OWN ANOINTING (1 Sam 17:38-39). David knew who he was – and who he wasn’t. Though offered the armor of the king himself, he recognized his unique anointing and rejected taking on another’s reputation and mantle. With the zeal of the Lord in his heart, he stayed true to himself and how God had trained him. Though we can learn from others who have been successful in battle, we must avoid the temptation to be like someone else. We must own our journey and the unique way in which God has prepared, equipped, and anointed us. That’s where our greatest strength will lie. HIS FAITH WAS NOT IN THE WEAPONS OF HIS WARFARE, BUT IN HIS GOD (1 Sam 17:40). Using a sling and some stones were far from the conventional weapons of the day. Not only did David reject Saul’s armor, he used tools that were seemingly useless to anyone else. Even so, his faith did not rely on the strength of his weapons, but in the strength of his God. We are inundated with books on warfare, tools for prayer, and guidelines for deliverance. In the end, it is our faith that overcomes the world. We must never confuse any prayer method or strategy with our confidence in God’s Word or will. Where prayers are a vehicle of deliverance, it is our faith that is the fuel. HE WAS NOT EASILY INTIMIDATED (1 Sam 17:44-47). Even though the voice of the enemy shouted in his ears, David was unmoved. He did not confront this giant ill-prepared. He went in with the full knowledge of what he was facing and ran towards the enemy without hesitation. The enemy will be relentless, and we must be prepared to face the constant threats and accusations. If we have filled our hearts and minds with God’s word before the battle, it will be God’s word that pours out of our mouths when we face that battle. Our courage comes from knowing God’s voice and the words He speaks. We then become conduits of heaven, issuing the decrees and purposes of the reigning King. HIS TARGET WAS SPECIFIC (1 Sam 17:49). David knew that the target was critical. As he declared the word of the Lord to this towering enemy, he put his faith in the supernatural power of his God and thrust that faith towards Goliath’s head. Aiming where it mattered most, David hit the target and brought the enemy down. As we pray and intercede concerning the giants we face, both personal and corporate, the Lord will give specific targets for the specific strongholds. It isn’t necessarily “more” prayer that will assure success, but prayer that is specifically aimed at the lies of the enemy and source of attacks. Effective intercession requires specific targets that are accurate and measurable. HE DID NOT BATTLE AS CULTURE DICTATED (1 Sam 17:50). 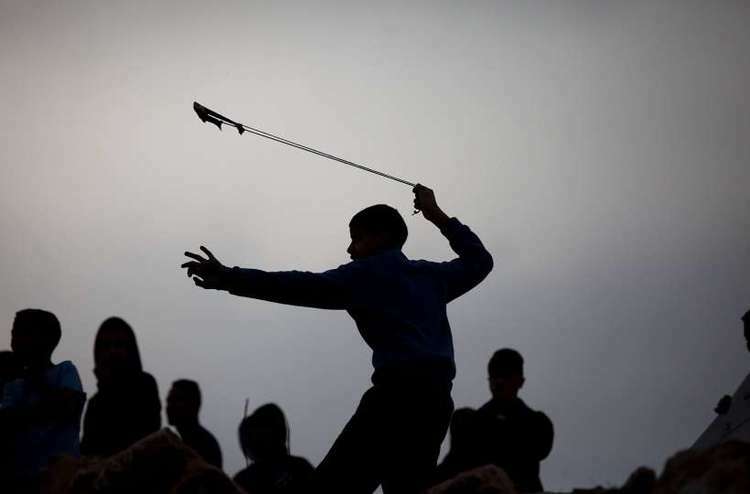 It says that “…there was no sword in the hand of David.” Where protocol expected a warrior to take a sword into battle, David took his staff, sling, and 5 stones. This giant was first taken down by the stone but was then killed with his own sword. David used the enemy’s weapons against him. In a powerful prophetic act, David killed the giant with his own sword, decapitating and forever silencing the voice of the enemy. Every battle is different. Where one battle may require a particular weapon and approach, another battle may necessitate something else. We must be sensitive to the Holy Spirit and not assume the battle plan. God’s purposes are higher than ours and we must face these giants from heaven’s perspective and not our own. At a time when being “warriors” is very popular in prayer circles, we must never forget that we are sons and daughters first. We were not created to live on the battlefield, but in the palace. Though we will face giants and use various weapons of warfare, our identity must be secured as those who rule and reign with our Heavenly Father. David’s example should stir us to consider how we approach the giants in our lives and in this nation. If we are to be effective in prayer, we must daily practice His presence. We must continually fill ourselves with the word of the Lord and know who we are. As we overcome our own battles, we will be entrusted with greater authority that can impact nations. It is not the size of the giants that matter, but the size of our faith that will be determined by our daily walk as sons and daughters of the King. Right on the mark! Blessings to you and yours. Powerful truth. A very timely reminder of the scope of our true identity and authority in this hour. Thank you, Wanda, for the exhortation!